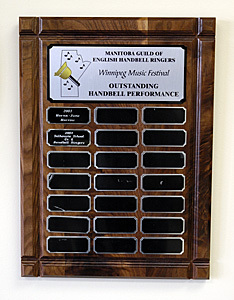 The Manitoba Guild of English Handbell Ringers donated the Manitoba Guild of English Handbell Ringers Trophy to the Winnipeg Music Festival in 2003. The Manitoba Guild of English Handbell Ringers (MBGEHR) was formed in 1996 and became the fifth province to join the Handbell Guilds of Canada (HGC). Through local workshops, Read and Ring sessions, Spring Ring Provincial Festival, National Ringing Link Conference and handbell concerts, the Guild promotes the art of handbell ringing in schools, churches, community groups and the general public throughout Manitoba.